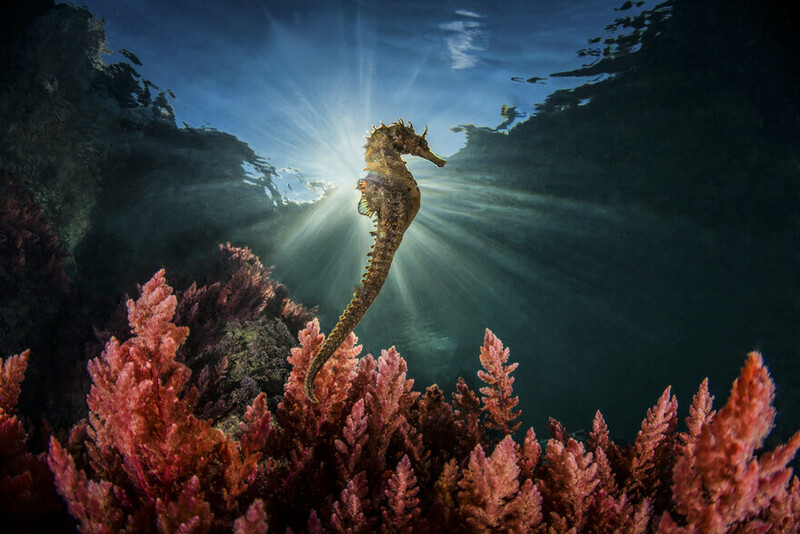 The image shows a Mediterranean Seahorse. It was taken in the morning at Spiaggia Caterina, Sant'Agnello (Naples) in January 2014. This place has a little harbour, where it is possible to find seahorses. They love to come here because there is not a lot of water movement. That morning I went to this place with a friend, searching for them. We were lucky because we met this seahorse in the first minutes of our dive. After I took the first shot, the male seahorse started to swim, moving from the red algae bottom, into the clear water column. I took many images and selected this one, with the sun behind the fish. The image was taken with a Nikon D800 and Tokina 10-17 mm, fixed at 17 mm. It was postprocessed from RAW file using Lightroom for colour adjustment and photoshop to remove dots of dust.